Nick and Hank investigate a homicide they discover is linked to a wesen rite of passage; Juliette makes an unexpected ally; Captain Renard battles a darkness within; Nick finds hope for Juliette in Adalind. *Juliette burns down Aunt Marie's trailer!!! Man, I thought the Juliette/Renard hookup was going to be the biggest obstacle to getting Juliette And Nick back together, but burning down the trailer?! All those centuries of lore and weaponry, irreplaceable and gone forever. I mean, Trubel has Porter's trunk of books & things, and the writers can introduce a secret Grimm 'Men of Letters' bunker somewhere if need be, but that was still a gut punch. Poor Nick. All those centuries of lore and weaponry, irreplaceable and gone forever. Yeah, that was painful. Now we know why the writers have had Wu reading everything. Wu is the lore master now. 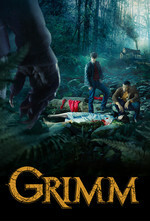 Just noticed that the AV Club is recapping Grimm again, yay. I'm a little surprised the narrative seems to be going in the direction of Juliette is awful simply because she's hexenbiest. I guess maybe genetic determinism to make you mean & vindictive isn't that different than Monroe struggling with rage and the mice people tending timid, but it feels to me more subtle and less something your biology drives you into. Unfortunately I'm not sure I feel like they've set it up to go any way other than "Juliette gets turned back" or "Juliette pisses off into the greater world," neither of which appeal to me. The cure doesn't seem like it keeps her around after these sorts of actions and I find that sort of water-under-the-bridge ending for her relationship with Nick kinda blah. Plus I like the actor and would be sad to see her go. Clunkiest line of the episode: "As long as we're digging up the past, we may as well dig up your mother." You can almost see Reynard wince as he delivers it. Wu is the lore master now. The show's also been leaning on the "this wesen isn't in the books but maybe Monroe and Rosalie know something about it" lever for a while now. Which I guess kind of makes sense somewhat: the Grimm lore is the knowledge that past Grimms were able to learn about wesen while hunting them. Because Nick's wesen-friendly -- at least partially so, at any rate -- he's able to tap into wesen culture and learn directly from them. I'm a little surprised the narrative seems to be going in the direction of Juliette is awful simply because she's hexenbiest. Juliette is definitely way more awful than I was expecting (which I like, actually, given that I thought Juliette was kinda bland and wistful and underutilized before), but I feel the show is giving us reasons for her behavior besides just "hexenbiests, amirite?" First, it feels like the show's kinda tried to make the point (that actually ties in with this week's "Iron Hans" rite-of-passage thing) that most Wesen tend to have some level of guidance and/or training as they develop their powers through childhood & adolescence (this episode & I think others seemed to make a connection between puberty and wogeing, also.) Juliette's been handed these powers out of the blue as an adult, which has really thrown her for a loop. Second, I'd swear there've been a couple of mentions that Juliette is a really really powerful hexenbiest, although no-one seems to be quite sure why she's so powerful. So it's like an extra dose of hexenbiest-ness, which added to her lack of training and experience with understanding and controlling her power is making her more awful and unpredictable. Third, and most important IMO, is the whole thing where's she's really been an outsider to the whole Wesen world up til now. For all that she loves Nick & Hank & Monroe & Rosalee & Wu, her whole life has been thrown into chaos more than once, and she's been unable to really do anything about it, she's had no power or ability to influence the direction of her life, she's been an innocent victim or collateral damage. Hank & Wu may not be Wesen or Grimm, but at least they're male cops with guns and the weight of authority and experience with fighting and with how awful people can be - she's a vet and a kind person and simply never had the tools to handle the kind of chaos and violence that's all through her life now. So deep down she really really resents this, she's angry (justifiably) that for the last four years she's really been just a piece of flotsam in the middle of a maelstrom. But now she's got the power to do something about that, and it's intoxicating, and all that resentment and anger is bubbling up. Wish they were selling that angle instead. Or had let her get slowly (or even not all that slowly) corrupted by it. Instead of full Mr Hyde. No idea why they're so set on keeping to 4 episodes on one day instead of giving it one daily timeslot, makes no sense to me as a ratings strategy. "Did you see that Netflix story? People love to binge watch!" I think it's more likely their syndication payments create an incentive for this, particularly when you consider that they have to fill all those hours with SOMETHING. The trailer is one thing that is a neverending source of annoyance and frustration to me. They are constantly going back to look things up in the books. If someone had just spent a few days DIGITIZING the books, they could just look things up on their phone. Plus a backup for things like theft/fire. Have any of the show's writers addressed this? Having spent a lot of time dealing with FOIA issues I don't find it remotely surprising that folks in that line of work would never think to modernize.